ASUKA (Pro Wrestling WAVE) – 19 years old, two year veteran. A rising star in the promotion, she is the first transgender Joshi wrestler. Miyuki Takase (Actwres girl’z) – Age unknown, one year veteran. 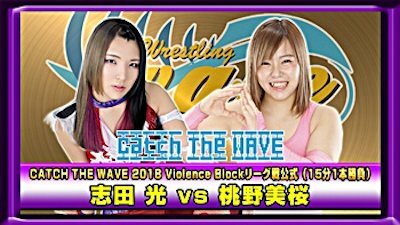 Regular participant in WAVE, also wrestles in PURE-J and her home promotion Actwres girl’Z. Nagisa Nozaki (Pro Wrestling WAVE) – 27 years old, 11 year veteran. Took layoff from 2013 to 2017. Current WAVE Tag Team Champion. Rina Yamashita (Pro Wrestling WAVE) – 29 years old, 4 year veteran. Former Regina di WAVE Champion and the winner of the Catch The WAVE 2017 Tournament. 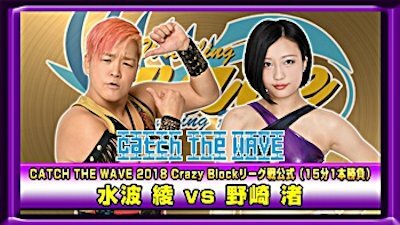 Ryo Mizunami (Pro Wrestling WAVE) – 29 years old, 13 year veteran. Former Regina di WAVE Champion and the winner of the Catch The WAVE 2016 Tournament. 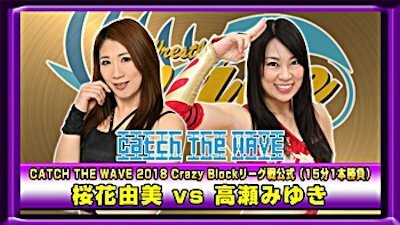 Yumi Ohka (Pro Wrestling WAVE) – 38 years old, 16 year veteran. Former Regina di WAVE Champion and the winner of the Catch The WAVE 2015 Tournament. Arisa Nakajima (SEAdLINagisaG) – 28 years old, 12 year veteran. Former Ace of JWP with 13 title reigns in her career, one of the top Joshi wrestlers in Japan. Ayako Hamada (Pro Wrestling WAVE) – 37 years old, 19 year veteran. With over 20 title reigns, the most accomplished wrestler in the tournament. Hikaru Shida (Freelancer) – 29 years old, 9 year veteran. Top Joshi Freelancer with 14 title reigns, winner of the Catch The WAVE 2014 Tournament. Hiroe Nagahama (Pro Wrestling WAVE) – 22 years old, three year veteran. Promising young wrestler in WAVE, former WAVE Tag Team Champion. Mio Momono (Marvelous) – 19 years old, two year veteran. 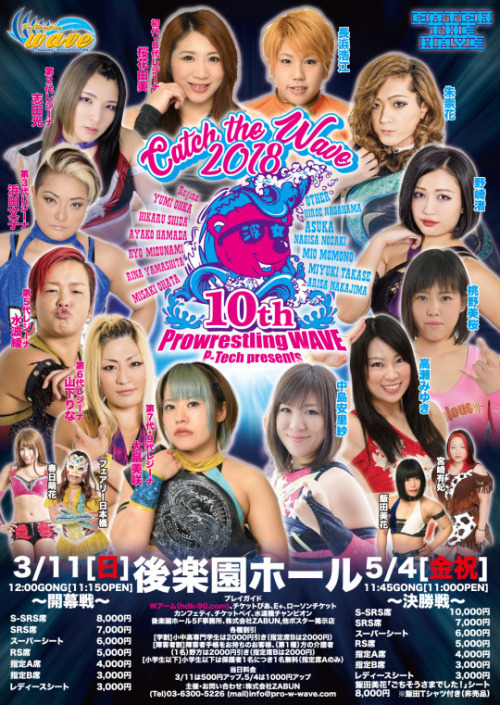 Talented young wrestler from Marvelous, also wrestles in WAVE, Sendai Girls’, and SEAdLINagisaG. Misaki Ohata (Pro Wrestling WAVE) – 29 years old, 11 year veteran. Current Regina di WAVE Champion and the winner of the Catch The WAVE 2013 Tournament. All wrestlers in the tournament have profiles on Joshi City, you can click on their name to go straight to it. 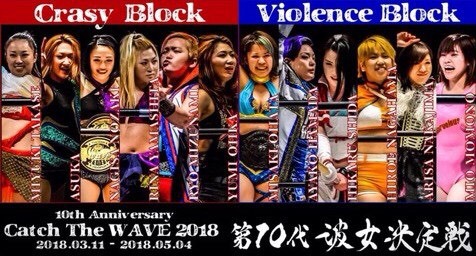 As this event was uploaded to the WAVE Network, all matches will be shown in full. Miyuki asks for a handshake as the match starts but grabs Yumi’s arm and applies an inside cradle instead for a quick two count. A schoolboy and a backslide by Miyuki also don’t work, Yumi boots Miyuki in the head a few times but Miyuki blocks one and goes for the sleeper. Yumi tosses Miyuki off of her, dropkick by Miyuki but Yumi avoid the leg drop. Trip by Miyuki and she locks on the sleeper, crucifix cover by Miyuki but Yumi kicks out. Dropkick by Miyuki but Yumi avoids the lariat attempt and hits a boot in the corner, she goes for another boot but Miyuki moves and chops Yumi in the chest. Lariat by Miyuki, she picks up Yumi but Yumi knees her off. Elbow by Yumi but Miyuki chops her back as they trade blows, Yumi wins the dual with a big boot but Miyuki blocks the suplex attempt. Miyuki hits a vertical suplex of her own, she goes to the second turnbuckle but Yumi avoids the diving leg drop. Boot to the head by Yumi, she goes off the ropes and hits another boot while Miyuki is against the ropes. Yumi picks up Miyuki, Miyuki goes for a bodyscissors but Yumi blocks it. Yumi goes off the ropes but Miyuki catches her with a powerslam, she gets on the second turnbuckle and hits a jumping elbow smash. She gets on the second turnbuckle again and hits a missile dropkick, she picks up Yumi and hits a rolling fireman’s carry slam. Miyuki goes to the second turnbuckle and hits a diving leg drop, but Yumi kicks out of the cover. Miyuki picks up Yumi but Yumi hits a DDT, heel drop by Yumi and she covers Miyuki for two. Yumi goes off the ropes but Miyuki avoids the boot and hits a headbutt, Yumi headbutts her back and the two trade headbutts. Miyuki gets Misaki on her shoulders and hits a spinning Samoan Driver, but Yumi barely gets a shoulder up on the cover. Leg drop by Miyuki, she goes all the way up but Yumi boots her in the face before she can jump off. Yumi flings Miyuki back to the mat and kicks Miyuki in the head, she goes off the ropes and hits one final Big Boot for the three count! Yumi Ohka wins the match and gets 2 Points. This match was basically what it needed to be. Yumi Ohka mostly just throws boots, which she threw plenty of here, and Miyuki isn’t really good enough yet to get Yumi to do anything outside of her box. Miyuki going for flash pins was the way to go, and really in a tournament setting anything can happen. Perfectly watchable but not overly exciting. Mio charges Hikaru as the match starts and begins throwing dropkicks, Mio trips Hikaru but Hikaru shrugs off the next dropkick attempt. Mio doesn’t slow down as she hits an armdrag, but Hikaru slows her down by kneeing Mio in the head. Hikaru suplexes Mio from the apron back into the ring, but Mio kicks out of the cover. Hikaru goes off the ropes but Mio dropkicks her, more dropkicks to the knee by Mio and Hikaru finally falls to the mat. Mio applies an ankle hold but Hikaru gets out of it, armdrag by Mio but Hikaru catches the crossbody and hits a backbreaker. Hikaru picks up Mio, Mio goes for a cradle but Hikaru blocks it and applies a Stretch Muffler. Mio gets to the ropes to force the break, Mio and Hikaru trade elbows until Mio hits a dropkick for a two count. Mio goes up top and hits a diving crossbody, but Hikaru rolls through it and applies a single leg crab hold. Mio gets to the ropes for the break, Hikaru picks up Mio but Mio wiggles away and cradles Hikaru for two. Mio goes off the ropes but Hikaru hits a jumping knee, vertical suplex by Hikaru and she covers Mio for a two count. Kick to the chest by Hikaru but Mio ducks the PK attempt and hits a series of elbows. Enzuigiri by Hikaru and she hits a Falcon Arrow, they trade flash pins until Mio holds down Hikaru with a European Clutch for the three count! Mio Momono gets two points. 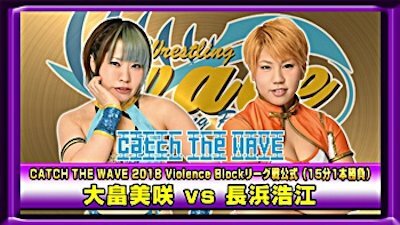 They start a bit slower than we’ve seen in the last few matches as they grapple for control, they both go for shoulderblock attempts until Rina sends ASUKA to the mat. ASUKA gets back up and snaps off a hurricanrana, Rina rolls out of the ring and ASUKA sails out onto her with a tope con hilo. Still outside the ring, ASUKA throws chairs at Rina repeatedly before returning to the ring, ASUKA goes up top and she hits a missile dropkick for two. Kicks by ASUKA and she boots Rina in the head, she goes off the ropes but Rina catches ASUKA with a knee. Lariats by Rina in the corner and she puts ASUKA in a Scorpion Deathlock, but ASUKA gets into the ropes for the break. Rina knees ASUKA in the back of the head and hits a scoop slam, she gets on the second turnbuckle but ASUKA kips up and hits a springboard side slam. Rina quickly comes back with a backdrop suplex but ASUKA hits a release German, lariat by Rina and both wrestlers are down on the mat. They trade elbows as they slowly return to their feet, superkick by ASUKA and she hits a gutwrench suplex for two. ASUKA goes up top but Rina gets her feet up on the moonsault attempt, Rina goes off the ropes and nails the sliding lariat for two. Rina picks up ASUKA and she goes for the Splash Mountain, but ASUKA reverses it with a hurricanrana. Chokeslam by ASUKA, she goes up top and nails the moonsault, but Rina barely kicks out of the cover. She goes up top again but Rina recovers and joins her, elbows by Rina and she hits a superplex. Rina applies a sleeper but ASUKA gets into the ropes for the break, Rina goes off the ropes but ASUKA catches her with a dropkick. Running Shooting Star Press by ASUKA, but that gets a two count as well. Both wrestlers go off the ropes and Rina levels ASUKA with a lariat, she picks her up and drops ASUKA with the Splash Mountain, picking up the three count! Rina Yamashita wins the match and gets two points. After a handshake they lock up and trade wristlocks, Arisa gets Ayako to the mat but Ayako switches positions with her as they go back and forth. They end up back on their feet, headbutt by Ayako and she starts on Arisa’s arm. Arisa trips Ayako and applies a side headlock, Ayako gets out of it and they trade trips before reaching another stalemate. Springboard armdrag by Arisa, another armdrag by Arisa but Ayako blocks the next one and hits an armdrag of her own. They trade armdrags and both miss dropkicks, kick to the head by Ayako and she slides Arisa out of the ring. Ayako goes out after her and hits a vertical suplex on the floor, she gets back into the ring and Arisa slowly follows her. Kick to the back of the head by Ayako and she covers Arisa for two. Ayako applies a double armbar but Arisa get to the ropes for the break, Irish whip by Ayako but Arisa avoids her charge and slaps Ayako in the face. Ayako and Arisa trade elbows, tornado DDT by Arisa and she hits a dropkick. Arisa goes for a suplex but Ayako blocks it, they go back to trading elbows until Arisa hits a boot and a release German. Arisa goes up top and delivers a missile dropkick, elbow by Arisa but Ayako boots her hard in the face for a two count. Another kick by Ayako, she picks up Arisa and she hits a backdrop suplex. She goes for another one but Arisa lands on her feet and hits a German suplex hold for two. She goes for the dragon suplex but Ayako blocks it, high kick by Ayako but Arisa rolls out of the powerbomb attempt. Enzuigiri by Ayako, she goes up top but Arisa hits her from behind and suplexes Ayako off the turnbuckles to the mat. Running double knee by Arisa, she then goes up top and hits a footstomp to Ayako’s back. Arisa goes back up top and delivers a moonsault, but Ayako kicks out of the cover. Arisa goes off the ropes but Ayako catches her with a heel kick, Ayako pulls Arisa out to the apron and she hits a DDT. Ayako goes up top but Arisa hits her before she can jump off, Ayako falls out to the apron and Arisa goes to the top turnbuckle before jumping off and slams Ayako’s head into the apron. Arisa goes back up top and hits a diving footstomp, but it gets two. Arisa picks up Ayako and she hits a German suplex hold, but Ayako kicks out of that as well. Ayako gets away from Arisa and hits a pair of heel kicks, Ayako picks up Arisa and nails the AP Cross for the three count! Ayako Hamada wins the match and gets two points. The last time these two met, Nagisa won in just over two minutes, so Ryo is looking for a bit of revenge. Ryo gets Nagisa to the mat early on and applies a headlock, she goes for a triangle choke but Nagisa rolls into the ropes for the break. Back up, Ryo applies a headlock but Nagisa Irish whips out of it and pulls down Ryo by the hair. Kicks by Nagisa but Ryo hits a hard shoulderblock, scoop slam by Ryo and she hits a series of leg drops, but Nagisa rolls out of the way of the last one and goes for a choke. Ryo quickly blocks it, Nagisa knocks Ryo into the corner and hits a running boot to the head. She hits a second one before kicking Ryo in the face, Nagisa gets on the second turnbuckle and dives off with a missile dropkick. Somato by Nagisa, but it gets a two count. Nagisa goes for the sleeper but Ryo elbows out of it and drops Nagisa with a cutter. Nagisa goes for a boot but Ryo moves and lariats her in the back, Nagisa connects with her next boot attempt but Ryo hits a scoop slam and hits a leg drop for two. Spear by Ryo, she picks up Nagisa and gets her on her shoulders, but Nagisa gets out of the backbreaker with a choke hold. Sleeper by Nagisa but Ryo rams her into the corner to get out of it, elbows by Ryo but Nagisa boots her in the arm. Discus Lariat by Ryo, but Nagisa barely gets a shoulder up. Lariat to the back and then the front by Ryo, but again Nagisa kicks out of the cover. Ryo picks up Nagisa and gets her on her shoulders again, but again Nagisa puts Ryo in a sleeper. Ryo gets out of it and goes for the Hot Limit but Nagisa blocks it, Nagisa bounces Ryo off the ropes and applies the Dragonfly Sleeper Hold until Ryo goes to sleep! The referee calls for the bell and Nagisa gets the win, plus two points in the tournament. 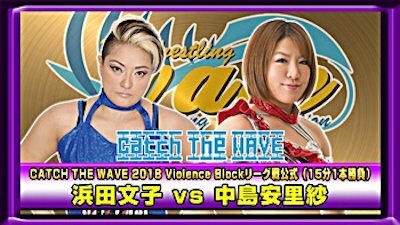 It is interesting that WAVE is pushing Nagisa so hard, as while she brings something different to the table, she isn’t as skilled as most of the wrestlers in the promotion. 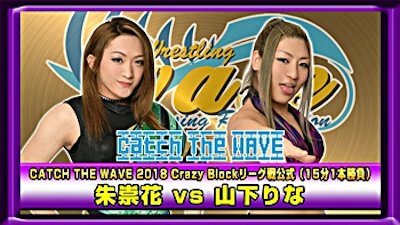 Even before her long layoff she wasn’t a high end wrestler, and since returning she still has a ways to go to reach the tier that WAVE seems to want her to be. The match wasn’t bad but it wasn’t good either with a couple miscommunications, lots of repeated spots, and a sudden ending. Ryo is good but needs the right opponent to really bring the best out of her, and she has little chemistry with Nagisa. I like what they are trying to do with Nagisa, I just hope it connects at some point as the quality of her matches is generally average. Main event time! Hiroe dropkicks Misaki from behind and keeps up the attack, but Misaki avoids her crossbody out of the corner. Misaki goes for a low crossbody of her own but Hiroe moves, leading Misaki to crash hard into the turnbuckles. Suplex by Hiroe, she goes off the ropes but Misaki blocks her hurricanrana attempt and applies a crab hold. Hiroe gets into the ropes for the break, Misaki slams Hiroe’s face into the mat before giving her a curb stomp. Two more curb stomps by Misaki and she applies a chinlock before hitting a final curb stomp onto Misaki. Scoop slams by Misaki, she drapes Hiroe over the second rope and jumps down onto Hiroe’s head before covering her for two. Chinlock by Misaki, she lets go after a moment and goes for a suplex, but Hiroe blocks it. Irish whip by Misaki but Hiroe blocks it and rolls Misaki to the mat before hitting a dropkick. Crossbody out of the corner by Hiroe but Misaki blocks her suplex attempt and hits a DDT. Misaki goes off the ropes and Hiroe goes for a Northern Lights Suplex, but she can’t keep the hold applied due to an injured back. Misaki stomps on Hiroe and goes up top, Hiroe joins her but Misaki slides back down and goes for a powerbomb. Hiroe blocks that and hits a modified Codebreaker, she goes up top and delivers a missile dropkick. She goes up top again and hits another missile dropkick, a third missile dropkick is next followed by a fourth before Hiroe covers Misaki for two. Northern Lights Suplex Hold by Hiroe, but that gets a two count as well. Hiroe picks up Misaki but Misaki gets away and snaps Hiroe over her knee, low crossbody by Misaki and she goes up top, hitting a missile dropkick. Three more missile dropkicks by Misaki, she positions Hiroe and goes up top again, this time hitting a diving bodypress for a two count. Misaki picks up Hiroe but Hiroe blocks the suplex attempt so Misaki drops Hiroe face-first into the mat instead and applies an inverted crab hold. Hiroe gets to the ropes to break the hold, Misaki stomps on Hiroe’s back but Hiroe gets up and elbows Misaki. They trade elbows until Hiroe goes for a few quick pins, none of which have any luck. Misaki goes off the ropes but Hiroe hits a spear, cradle by Hiroe but Misaki reverses it into her own two count. Spinning backfist by Misaki and she delivers a German suplex hold, she quickly picks up Hiroe and nails the Fisherman Buster, but Hiroe kicks out at two. Misaki goes for the Blue Sky Suplex Hold but Hiroe blocks it, sliding kick by Misaki and she covers Hiroe for a two count. Hiroe blocks the Blue Sky Suplex Hold again, she floats over Misaki and covers her with a jackknife hold for the three count! Hiroe Nagahama wins the match and gets two points in the tournament. A solid way to start off the tournament. Just about everything was good, and Asuka/Yamashita in particular is worth tracking down. The tournament setting makes it hard to have “MOTYC” style matches since its all about the journey to get to the finals, but they worked well within those restrictions. The tournament is chock-full of quality wrestlers, I imagine as the tournament goes on they will continue to deliver.